Nettle tea against hair loss (3 hairprotection points)	Noch nicht bewertet. 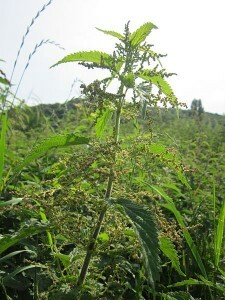 Nettle tea is a traditionally used as Hair Fitness drink but can also be massaged in the scalp for this pupose. In Nettle tea there are many healthy ingredients such as silica, iron, magnesium, vitamin C , folic acid, nitrogen , chlorophyll, provitamin A and phosphorus. This mixture makes the tea with regard to hair health really interesting. Especially since the ingredients of the Nettle tea also inhibit inflammatory processes in the body. The tea is a cure not only as a beverage. Even with the topical use the ingredients against scaly and greasy hair look . They promote blood circulation to the scalp and reduce dandruff. The roots of the hair are strengthened by the ingredients . Preparation: Drag nettle tea after cooking for at least 10 minutes. Internal Application: We recommend a day at least 2 large cups to drink in small sips . Local Application: The cooled tea can be used as a hair rinse . After shampooing to towel-dried hair and give thorough massage . Then comb hair normally.